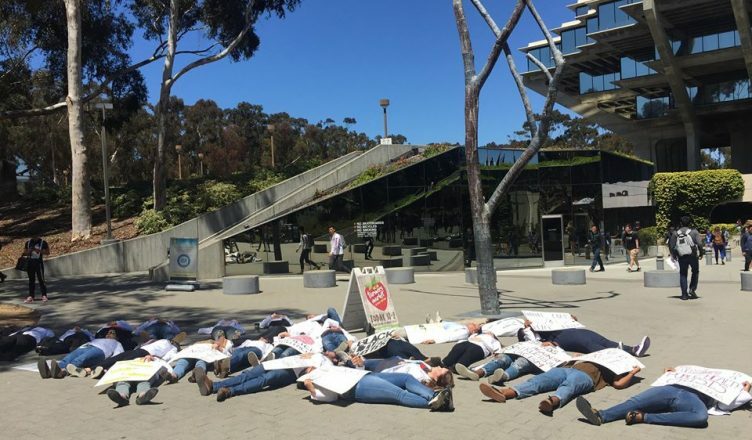 The UC San Diego School of Medicine chapter of White Coats for Black Lives, a national organization to address racial bias in the practice of medicine and the danger of racism to the health of people of color, staged a “die-in” protest outside Geisel Library this afternoon as part of a nationwide effort against police brutality. Approximately 30 medical students donned their lab coats and lay on the ground in front of the Silent Tree, pretending to be dead. Many of the students held signs with phrases like “injustice anywhere is a threat to justice everywhere,” “hands up don’t shoot,” and “Racism is a public health crisis. It must end now” that called attention to issues facing the black community, particularly police brutality. After laying on the ground for at least fifteen minutes, several students stood up to speak. Four of the demonstrators read a biography of Stephon Clark, an unarmed black man gunned down in his grandmother’s backyard by the deputies in the Sacramento Police Department, and the police and autopsy reports detailing the events leading up to the shooting. “Of the 987 individuals shot and killed by the police in 2017, 23 percent were black despite only 13 percent of the U.S. population being black. In 2017, black people were nearly three times more likely than white people to be shot and killed by the police,” one of the demonstrators read from a piece of paper with statistics highlighting the disproportionate jailing and shooting of black Americans compared to other racial groups. 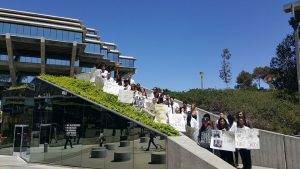 The students wrapped up the demonstration by gathering on the steps outside Geisel, holding up their signs. White Coats for Black Lives began in 2014 when medical students across the country felt inspired by the Black Lives Matter movement to stage independent die-ins at their medical schools. These individual groups then came together to stage a national die-in on December 10, 2014 and formed White Coats for Black Lives on Martin Luther King Jr. Day in 2015. Led by the UC Davis chapter, today’s WC4BL demonstration was a coordinated effort by the different chapters to address Clark’s shooting. “Join us as we come together to: stand in solidarity with victims of police violence, demand accountability from those in power, urge healthcare institutions to provide greater trauma-informed care to afflicted communities,” the White Coats for Black Lives Facebook page stated. Additional reporting by Rebeca Camacho. Main image by Madeline Leon | UCSD Guardian.